alltitude SA is a professional service company. For almost 15 years, we’ve been contributing to the success of our clients’ projects through the quality of our consultants’work. Our approach is established on the respect of human values and long-term relationships with our employees and customers. Make the most of your application and let us know about your expectations and motivation, the type of job that interests you, the localization, your salary expectations,… this is perhaps the opportunity to give a new impetus to your career and get you to the next level. 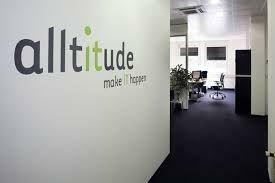 Join our group « alltitude IT Carreer opportunities » on LinkedIn.